Since I have started written this blog, I havn’t mentioned about my favourites; my favourite cricketer, my favourite captain, my favourite umpire, my favourite batsmen, my favourite Indian cricketer and so on. From today onwards, I will start writing about my favourites, starting from my favourite cricketer. It is really not a matter of surprise when I say that my favourite cricketer is former South African all rounder, Lance ‘Zulu’ Klusener. He is my favourite cricketer till date. No other player has leave an impact on me, till that famous Test Match in Kolkata’s Eden Garden where Lance Klusener took 8 wickets in the second innings of the Indian innings. Since then, my liking for Zulu developed so much that I still adore him as a cricketer. For me, he is and will be the greatest ever all rounder the game has seen. When he used to bat, he doesn’t look as if he is an all rounder. When he came to bowl, he doesn’t look like a brutal batsman, who is just ‘trying’ his hand in the bowling. He is the genuine all rounder and the most powerful hitter of the cricket ball, in the era of late 90s. I still remember that sad 99 World Cup semifinal against Australia, when Alan Donald ran very late, which result in a tie and South Africa’s exit from the World Cup. People might say that he was meant for One Day Cricket, but for me, he was ‘The Man of All Seasons’. He used to bowl long spells in Test Cricket also. His batting, especially his approach while chasing a huge victory target was very strange. He used to play calmly when the required run rate reaches beyond 6 runs per over. He used to play normal cricket when the run rate started to rise above 9 runs per over; and when the run rate started reaching 12 runs per over, he used to play a bit fast. He used to start hitting madly when the run rate reached 15 runs per over. Then he gets unleashed and swings his bat like a butcher swings his knife! He was just the perfect finisher (though some would name Michael Bevan). After the loss in World Cup 2003, South Africa cricket saw a major change, with Shaun Pollock left captaincy and Graeme Smith was appointed the new captain (though he wasn’t even in the World Cup squad and was called after an early retirement by Jonty Rhodes). I still hold a very strong opinion that Smith was jealous from Klusener and saw him as a potential threat to his captaincy. Also, Zulu used to bat, the way he liked. Result, ego-hassles happened between them and Zulu was shown the exit door from the national team. 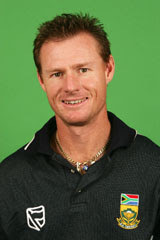 Smith used to receive a ‘Boo’ from his own country’s public – thanks to his villainous role in Klusener’s controversy. Zulu used to be a Darling to most of the South African nation and to the rest of the world, as well. I hold very high regards for the army man, Lance Klusener; a simple and straight forward guy who achieved the Pinnacle of his career, when he was adjudged Man of the Series in World Cup 1999. He scored 481 runs at a whopping average of 140.5 with a strike rate of over 130 and took 17 wickets – a true all round performance. Zulu, I simply love you!! !